Relax. Relax? Who? When? How? Hi Sarah. Thanks so much for letting me stop by today as part of the Perpetual Light Blog Tour. As anyone who’s ever released their first book knows it’s a little bit stressful. There are so many things to worry about. Let me list a few because they’re amazingly fresh in mind! Am I doing enough promo? Are the dates of everything lining up? What if something happens and the book doesn’t really release? What if the book releases and that’s when I find out it’s terrible? What if my mom hates it? What if someone asks me to do a reading? In public? What if no one, not even my mom buys the book? Why would she buy the book? I’m giving her a copy! Oh, God, no one is going to buy this book! What in God’s name was I thinking? Publish a book? Have I lost my damn mind? Yes, that’s what February 20, 2012 was like for me. It was the start of this blog tour and I was ever so slightly nervous. And who heard about it? My sister- via text message. The poor woman only wanted to know how I was. Have you ever received a novel-length text message? Well, that wasn’t the first she’d received, and I’ll bet it won’t be her last! My husband called at lunchtime as he does everyday, and I unloaded on him because now I was several hours into a worrying fit and had not managed to do any new writing. It was a short conversation during which he told me not to worry, everything would work out fine and then asked what was for dinner. My sister-in-law called around 4 PM, and by now I’d convinced myself I should jump from the second floor window. She was very clear on that idea being the worst I’d had. Then said all the things a good sister and friend says about how the book would be a huge success and I’d come so far and I shouldn’t try to write my other book today. I should focus on my blog posts and enjoy the moment. It helped. I didn’t jump. But I didn’t relax. It took about 24 hours for me to finally come down out of the stratosphere and rejoin the world. In that period of time I tried a number of things to relax. I hit the treadmill, twice. Didn’t help, though I do love to blast my music when I workout. I ate chocolate. Lots of chocolate. Chocolate covered pretzels. Chocolate covered cherries. Chocolate covered coffee beans. Red velvet tea. Oven roasted dark chocolate almonds. (Thank God for that treadmill!) I tried to read another Mary Janice Davidson Undead story. Got four pages in and began wondering if I’d be as successful as Mary Janice and then stopped reading. To say I’d worked myself up is an understatement, though that kind of energy does get things done- laundry, bathrooms, ovens, dinner. Of course, that was all done by 9:30 in the morning along with one trip on the treadmill. I finally managed to relax the following evening. I’m not sure if it was just time to let go and relax or if my little friend just knew what he needed to do. But around 8:30 Dino, our very lovable black Labrador followed me everywhere I went until I finally got the hint. He wanted to cuddle. He’s so cute. He grabbed one of his many stuffed babies and came running over. He’s about 70 pounds but he likes to lay in my lap and hold his baby. And that just did it. Put everything back on track. I love that dog! My grandfather always said, “Worry about nothing, Dolly. It all works out.” And he was right. My posts are all off and done. My book is released on time. And I’ve sold some copies. I will get reviews- good and bad. And that’s just life. Everything always works out. What do you do when worrying seems to be getting the best of you? Feel free to share some strategies. I can always use new ideas! I’d like to offer a $5 gift certificate to Barnes and Noble to one random commenter. All you have to do is comment on the post to be entered to win. To increase your chances of winning connect with me via one or more of the social networks listed below. Everyone who comments is entered into the grand prize drawing for an eReader- Kindle Touch or Nook Simple Touch. On this momentous of days devoted to love, I’m reminded of one of the reasons I love my husband: he makes me laugh. Sometimes it’s on purpose, other times it’s not, but the result is the same—I’m laughing at him or with him. One evening we were heading back from dinner and I was feeling a little buzzed and flirty. I imagined the young man, whose pizza delivery car pulled alongside ours at a stoplight, was smiling my way. He was be-bopping to his loud music, pulsing his head to the rhythm I could feel through pavement our cars shared. For a moment I was flattered, thinking he must assume I’m closer to his age and a flood of feeling good coursed through me. The evening of the Pinewood Derby races in boy scouts, we went out to a friend’s birthday party at a local bar. Pete pulls into the unlit parking lot of a nearby failed restaurant. Do you have any funny moments with your spouse you’d like to share? Love makes the world go round, laughter opens your heart, and passion keeps you strong no matter what the world throws your way! To learn more about C.J. 's books (where you can read half of the novels for free), please visit her website at www.cjellisson.com. Here's a snippet from my upcoming release Captive Moonlight. The main characters are Joe and Charlotte. This is my first western paranormal romance. This is pretty much a continuation from last week. Enjoy! He froze, and his nostrils flared. "Damn it. Your maid must be coming to check on you." Her eyes widened, and she hopped out of bed. She stared at the door, hoping her maid, Betsy, wouldn't come in without knocking. Charlotte needed to look presentable before that happened. Captive Moonlight now available at Changeling Press. Valentine's Day -- the holiday of love -- is almost here, and I'm excited to be participating in the With Love, Valentine's Day Blog Hop! It runs from today until February 14th at 11:59 PM. I hope everyone grabs some great prizes this weekend! If I get over 20 people who enter, I'll give away two prizes for this event. The first prize is a digital copy of my newest release Captive Moonlight from Changeling Press. The additional prize would be a winner’s choice eBook from my backlist. 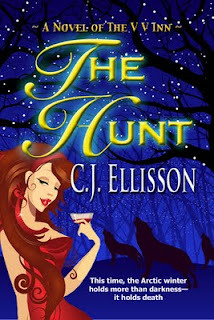 When her betrothed, Joe, is taken captive by a group of men looking for werewolf laborers, it's up to Charlotte to track him down and win him back -- even if that means putting her own life in danger. Visit the other Valentine's Day Blog Hop sites here. Before I start my Writer Wednesday, I have a couple News Bytes to share. Today Jungle Heat is being featured on Nook Lovers as a Daily Cheap Read. I also have been interviewed by Linda Andrews on her blog. Also, tomorrow I'm guest blogging at TRS Blue's blog, and I'll be participating in the TRS Release Party. I'd love if you would stop by! It's been a couple weeks since I've done a Writer Wednesday. I was looking through my early blog posts to see if I could get a glimmer of what to write about, and I noticed how much I used the word "try" in my blogs. I give myself credit for all that trying since I wouldn't be where I am today if I had stopped, but there's something pretty important I've learned in the time between then and now. As the Yoda quote goes, "Do or do not. There is no try." I can't say I'm perfect now. I know there are still some areas that I struggle with in being a writer. Some of them are even ones I struggled with back then, but I have more fortitude and willpower because I believe in myself more. My ability to write and edit have increased, and I know that getting published isn't like winning the lottery. I know it's possible, and it will happen. Obviously, since I just had a book come out with my publisher, right? Wherever you're at as a writer right now, strive toward what you want whether that's improving your writing craft or getting published. It might take a while, but then again, I've been on my journey quite a while too. Here's a snippet from my upcoming release Captive Moonlight. The main characters are Joe and Charlotte. This is my first western paranormal romance. This is a continuation from last week. Enjoy! She cocked an eyebrow at him. "Get right on with it soon before I start sprouting gray hairs." His eyebrows rose, and he leaned back over her. "Saucy girl. Maybe I'll have to show you what I'd like to get right on again with." He pressed his hard shaft against her thigh. This story also marks my first time writing something historical, which I've wanted to do for a long time. I was an English/History double major before I realized I wanted to get out of college quicker than getting the double major would allow. Captive Moonlight is book 3 of the Wolves of the Wild West multi-author series, but it stands alone. I really hope you all enjoy it! Please let me know what you think!